"​A replica weapon is a reasonable facsimile or copy of a weapon, even if it is not capable of discharging a projectile or substance..."
So a replica weapon is one that is a reasonable facsimile or copy of a weapon, regardless of its ability to discharge projectiles or not. Remember that all G1 Megatron reissues (and eHobby Megaplex) are capable of shooting projectiles in gun mode, and they are absolutely classified as replica firearms. you make Megatron sound very dangerous. Thanks for this thread and all the info Griffin. I have a question (for anyone) how the hell do chain stores get to sell Nerf (and other toy) guns without any issues? Do they have to get individuals permits for every single toy gun they sell, and how are people who buy them allowed to drive them home in their car, or kids allowed to play with them as it doesn't follow ANY of these rules/regulations/laws. And how do customs know what packages contain a replica gun, is it purely based on X-rays and the shape inside the package? Would the regulations still apply to the importation of NERF style toys, given that they can be bought in OZ and obviously don't get destroyed based on how many of them are at chainstores nation wide. Are there any sub-clauses for gun-like items, like I don't know sci-fi laser guns that have no real world equivalent etc. the issue with replica and imitation firearms is that they can be used to exert fear. You can't really do that with a nerf gun. As for customs, I'm pretty sure they just X-ray stuff to see what's in it and they'll open a package if they think it's suspicious. There is a clause on that however, nerf guns (and for that matter any other toy guns) cannot shoot a projectile past a certain pressure threshold otherwise it is deemed a safety hazard thus also be unable to be sold or even imported without certain import certificates. An example of a restricted Nerf gun is the Nerf Rival blaster, it shoots ball shaped projectiles at a higher pressure then the limit allows thus is not sold in Aussie stores. The first three Megatrons don't fall under the classification because they're too small and there's no way that they can be mistaken for being real. Henkei! Megatron transforms into a Nerf Maverick and is thus not classified as an imitation firearm. The gun pictured above is the heavy blaster pistol used by Han Solo in Star Wars. The gun on the bottom is the real life Mauser C96 semi-automatic pistol, which obviously inspired the design of Han's blaster. 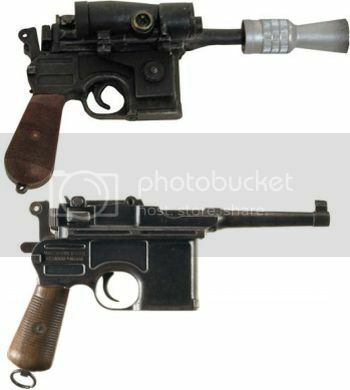 Although the DL Heavy Blaster is a fictitious scifi gun, it does bear striking similarity to the Mauser C96 and thus could be easily mistaken for one. Consequently Han's blaster is classified as a replica firearm. Note that we are talking about pistols here. If you're talking about rifles, then that falls under a whole different legal category (both for owning real or replica rifles) which goes beyond the scope of Gunformers since they're all pistols. So my next question is do you think I would have any issue with buying the following items which turn into non realistic guns. Transblasters. They are nerf guns, robots, but more like real guns than your average toy gun in Kmart. I'm still confused on the point that certain toy guns are not realistic but in the regulations listed here it says color does not matter and does not make a toy exempt. Bit of a contradiction there. Any idea how to interpret that? I've seen / held real guns and replica guns. So just interested in the toy stuff, but thanks for your excellent examples. I'm already pretty familiar with laws for actual guns, safe storage etc. I seriously doubt that would be stopped by customs. But you never know these days. Those should all be fine as they are replica Nerf guns, colour doesn't matter so much as the shape. When it says colour doesn't matter in the regulations I believe it means even if a realistic looking gun is fluro pink it's still a replica gun because it's close enough, the same as Goki's Han Solo gun is "close enough" to a real model of gun so it requires a license. If in doubt ask a police officer, call a support hotline or send an email with a picture of the toy and ask if it's ok to own them without a license. I don't think you'd have a problem getting them in. They look like being on the same level as the Classics Voyager Megatron. I got my Henkei version of the mould through no problems.